By Xah Lee. Date: 2016-05-11 . Last updated: 2016-05-12 . I tweeted that this morning, then, i got some answers. Professors specify the exact books for their courses, so that there are basically no competition. Publisher unnecessarly release new editions, so that it drives price up, and make old editions worthless. there's the Principal–agent problem, or, “someone else's money problem”. That is, person A pick things, person B has to pay. Since person A isn't paying, he's usually not keen about HOW MUCH. Soon, prices will get out of hand. and, for highschool books, which the government buys and pays, there's no exorbitant price phenomenon. The publisher do what they can to raise the prices, because, once a book is published, now with ebay and amazon and internet, people can easily buy used. So, publisher now can only sell a edition once. So, they try to make new edition every year or two, by tweaking exercises, wording, re-ordering stuff, etc. 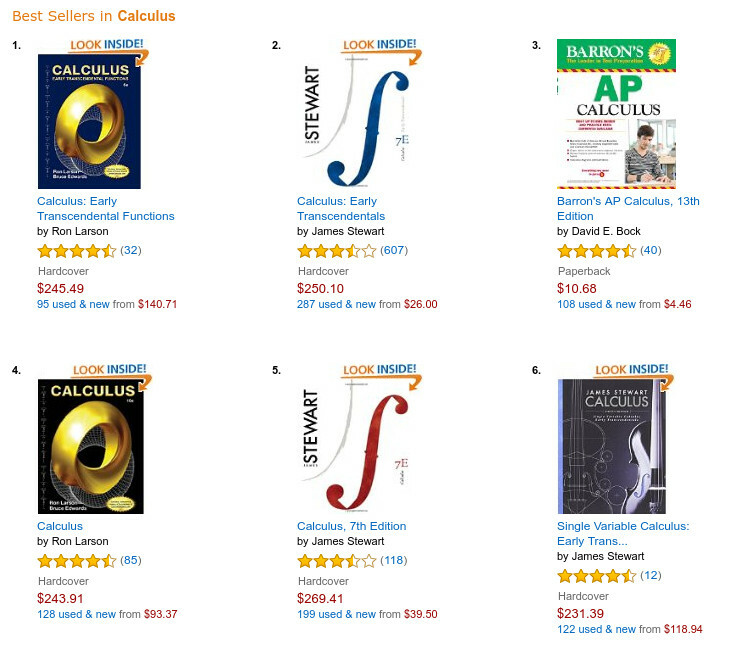 The calculus books above, that one by James Stewart, was in use while i was in college in 1991, and if i recall correctly, it was hellish expensive at $60. Now it's whopping $250. Sure, it's many editions over. But, do calculus text actually need change in 20 years? actually, not really, except maybe change writing style to be intune with current political thoughts. NPR has a episode on the very question. It is just 15 minutes. there's this wonderful project, open source textbooks. I looked for calculus textbook, and found a reasonable ones.